Lies Beneath (Lies Beneath #1) by Anne Greenwood Brown. Calder White lives in the cold, clear waters of Lake Superior, the only brother in a family of murderous mermaids. To survive, Calder and his sisters prey on humans, killing them to absorb their energy. But this summer the underwater clan targets Jason Hancock out of pure revenge. They blame Hancock for their mother's death and have been waiting a long time for him to return to his family's homestead on the lake. Hancock has a fear of water, so to lure him in, Calder sets out to seduce Hancock's daughter, Lily. Easy enough—especially as Calder has lots of practice using his irresistable good looks and charm on ususpecting girls. Only this time Calder screws everything up: he falls for Lily—just as Lily starts to suspect that there's more to the monsters-in-the-lake legends than she ever imagined. And just as his sisters are losing patience with him. This is the first mermaid-based paranormal book I have ever read and though I was curious, I didn't really expect to love it because I'm picky about my choice of paranormal creatures. However, I after reading it, I realized this - Mermaids are utterly fascinating. 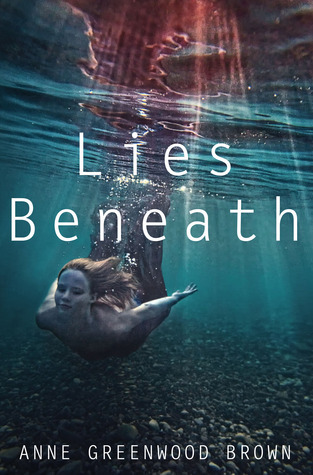 For some reason, I assumed that Lies Beneath would be just another paranormal love story but with mermaids..maybe something along the lines of The Little Mermaid but this had a whole twist to it. Mermaids aren't sweet, pretty and lovely. Well, they are pretty and lovely but they're definitely not sweet in Anne Brown's story; Mermaids are cold-hearted, cruel creatures who kill humans to take their emotions for their own, in order to prevent themselves from going insane. It took me a few pages to realize that I was reading from a boy's point of view but that may just be me. Lies Beneath is a story of revenge; one that the White family has been waiting for a long time to take on a person called Jason Hancock. Calder's job is to get friendly with the Hancock family and lure Jason to the lake somehow so his sisters can kill him in a slow and painful way to get their fill of revenge. However, there's just one problem - Calder falls in love with Jason's daughter Lily and that pretty much screws everything up. The storyline, while nothing exceptional, managed to hold my interest but mostly it was the part with the mermaids that had my complete attention; it's a whole new paranormal world for me and I loved reading about Calder and his sisters. Although Calder seemed a little too close to human a lot of times, his sisters definitely played the cruel, vengeful mermaids well. Over all, if you're a paranormal fan but have never read a mermaid based story, give this one a shot! I enjoyed reading this book and I didn't even realize how quickly I was reading it (that's always a good thing). Even if you have read other mermaid novels, while I'm not sure if it's unique (since I have nothing else to compare it to), Lies Beneath still makes for an entertaining read and is worth checking out. I'm pretty sure I'll be picking up the next book in the series! This is on my list to read...and I read a lot of mermaid books so i'm excited!